Chris Bleicher about her studio mascot "Carmen"
"Carmen" is a spanish streetcat that found me when an Italian friend invited me to her holiday villa in Spain; the ground level guestrooms were fully occupied: On the first night "Carmen" jumped into my bed and from then on visited me every day. The special thing about it was: in that villa and in the garden two big and two small dogs had been running around. At meal time the tiny kitty was sitting in the kitchen on top of the refrigerator and the four dogs respected her. How she manged this is still a miracle for me. After my departure I could not get this cat out of my mind. My friend took the kitty after the holidays from Spain to Italy where she did not get along with the dogs. As a result a friend then brought "Carmen" in the dead of night to Munich to my home. "Carmen" first got rid of any suspect of tape-worm, ear mites and mice flees and was later neutered. The first days and nights of course I was fearing a great deal about my artwork - I was afraid that the tiny "wild" cat could damage something, which was not the case until today. One the contrary! After about eleven years I'm still wondering about "Carmen" and her way to respect things which are important to me: This means: since the first day of our living together she doesn't dig her claws into my art and my furniture, doesn't jump on tables and so on w i t h o u t training her. Our system works very simply: For getting an extra portion of food "Carmen" scratches very special deomonstrations at her scratching-tree which I gave to her from the beginning. Even during playing she doesn't use her long weapons, as well when I hold her against her will. What I like very much about her is, that she has her own will when she dislikes something. "Carmen" graces me through her presence and way, how we communicate together, our every day happiness cannot be replaced through any other thing. "Carmen" developed quickly to a luxury cat: what she likes most is raw meat, especially turkey cutlet and of course liver which she gets just once a year. Normally she gets normal tin food and Brekkies alternatively. For few years now my ex-neighbor Klaus and I do - I call it "Cat-Sharing": When I travel and other times, the luxury cat gets a second home in a big Penthouse with a terrace and on weekends she visits at his mountain cottage. I am always glad when I get "Carmen" back and he is happy, too. "Carmen" clearly feels at home in both places. 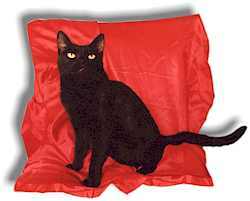 In my artist's studio "Carmen" however is the princess and wraps everyone - especially male visitors - with no trouble around her black velvet paw. Most often she sleeps on an antique small bench in the Edwardian-style, which some visitors would have liked to purchase. However, I always decline that offer and explain: "This is where my cat sleeps!" Otherwise she makes herself comfortable in her "Monkey's swing", the sleeping hollow on top of her scratching-tree. And more: After painting my own coffin in the context of the performance "Van Goghs Night", "Carmen" has also received from me, during her lifetime a very special declaration of love: I created her future Urn in pink with real marabu feathers and tiny toy-lizzards on the top. The urn is placed on a platform with pink neoninstallation. However, I hope, to have "Carmen" for a very long time.